Today, shipping containers are frequently repurposed for uses that have nothing to do with shipping goods. At Kiwi Box, we found that insulated shipping containers are an excellent solution for those who need to maintain controlled temperature environments. But, we’re not the only ones finding creative ways to recycle these versatile containers! Shipping containers have been touted by some as the ultimate building material.Insulated Shipping containers are in high demand thanks to their stackability, weather resistant design, and extreme durability. Shipping containers can be easily combined to create bigger buildings and structures and are generally affordable to purchase, making them a popular choice for those looking to create structures quickly and affordably. The humble shipping container came to the rescue after the city’s devastating earthquakes wiped out many of Christchurch’s homes and the main shopping district. Initially,insulated shipping containers were used to create safe spaces for construction workers in the CBD, support crumbling buildings, and protect pedestrians and drivers from falling debris so the city could start functioning again. Many businesses realised that they could use insulated shipping containers for temporary offices – an affordable option that helped them get back to business quickly. In fact, the demand for shipping containers in Christchurch was so high that it caused a nationwide shortage in shipping containers! Re:START is a project that gained worldwide attention for its innovative use of shipping containers to quickly rebuild City Mall, the main pedestrian mall in the centre of Christchurch that was destroyed during the 2011 Christchurch Earthquake. Through the use of shipping containers, the city has had its main shopping and social area restored, and with it a restoration of spirits and morale. Whether it’s a studio apartment created from a single container or a multi-level mansion created from several,insulated shipping containers have proven themselves to be a durable and useful building resource. Generally made from recycled containers, these unique homes are often designed to be eco-friendly. Although, using these insulated containers isn’t a new concept, it is certainly becoming more popular as more traditional housing becomes scarce and unaffordable. Building with insulated containers saves time, and money. The materials used are sturdy and resistant to many problems such as mould and rot, allowing for the production of a safe, healthy living environment. The homes are also easily transportable, making it easy to pre-fabricate them in one place and then transport them to their permanent location. In 2006, the biggest container village in the world was finished in Amsterdam, creating 1,000 student homes out of modified shipping containers. During the Gulf War, these sturdy, weather-treated insulated containers were used as makeshift shelters for soldiers and support staff. As mentioned earlier, many business owners relied on shipping containers after the Christchurch Earthquake to get their employees back to work and business flowing once again. Shipping containers have also been used as onsite wastewater treatment plants, market stalls and warehouses, and were used in the construction of one of Europe’s largest shopping malls in Odessa, Ukraine. Shipping containers are commonly used on construction sites for offices, media press boxes, school buildings, art studios, recording studios, and data centres. Studies indicate that the prison population will continue to increase in the coming decades. The planning team at New Zealand’s Rimutaka Prison came up with a novel idea to house the inmates and prevent overcrowding: they turned shipping containers into prison cells. Prison officials said that the cost of fabrication of the shipping container cells was half that of regular prison cells. One container can house three cells, each fitted with a double bunk, a toilet, shelves, and a small table – all created from durable, long-lasting steel. Shipping container hotels are popping up around the world, from London to Taranaki, New Zealand! In London, guests can stay in a 120-room hotel that was built using 86 modified shipping containers. In Taranaki, holiday bachs have been created from recycled gems in Oakura and Awakino. Commercial construction from shipping containers has become increasingly popular as businesses become greener and intent on managing rising building and labour costs. Shipping container hotels and motels are far cheaper to build and more environmentally friendly due to their recycled nature. Guests seem to love the novel nature of their travel accommodation and are usually excited to tell friends about their interesting stay when they get back home. What’s the most creative way you’ve seen shipping containers used? 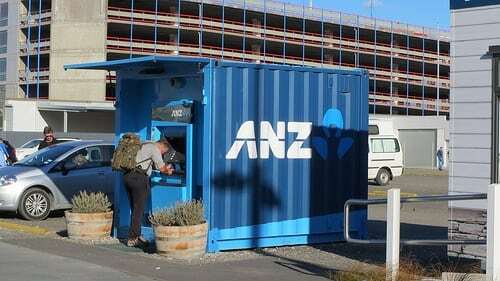 We’d love to hear about other ways that our beloved shipping containers are being used. Feel free to use the comment section below to share your experiences.